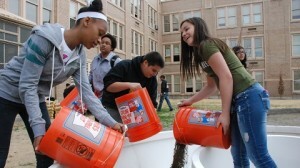 Under cloudy skies on a recent Friday morning, 13-year-old B’Azsae Gale concentrated on burying a feisty irrigation hose in the soil of a white modular planter that is part of a new “learning garden” on Denver’s West Campus. As Gale pushed the hose down, calling for more soil from wheelbarrow-toting classmates, he mused about the vegetables he hopes to plant. “Let’s plant some carrots,” he told Tighe Hutchins, community outreach manager for The Kitchen Community, the Boulder non-profit that created the sleek, modern-looking learning gardens. “Carrots! Yum. What about broccoli?” asked Hutchins. “Yeah, broccoli, and some bell peppers,” said Gale, who attends West Generation Academy. The West Campus learning garden will give 1,200 students at four schools access to fresh produce and hands-on lessons in science, math and health. But it’s just one small part of The Kitchen Community’s ambitious plan to create 180 learning gardens in Colorado, Chicago, Los Angeles and other communities in 2013. This pledge, which has been recognized by the Clinton Health Matters Initiative, will more than quadruple the 55 learning gardens installed by The Kitchen Community in 2011 and 2012. The Kitchen Community’s goal is to connect kids to real food and combat childhood obesity, which now affects 14.2 percent of Colorado children and 17 percent of American children.